Chandler police and enforcement officers with Arizona Department of Transportation investigate a shooting involving ADOT officers on Jan. 17, 2019. Chandler Police arrested two men Thursday afternoon in connection to an ADOT officer-involved shooting Thursday morning, Chandler PD said. One man is confirmed to be a suspect in the shooting and has a gunshot wound to the hand, according to Chandler PD. He was transported to a hospital. Another suspect was arrested along with the man with the gunshot wound and he is believed to be an "investigative lead," police said. Detectives with the Arizona Department of Transportation were involved in a shooting Thursday morning in Chandler. 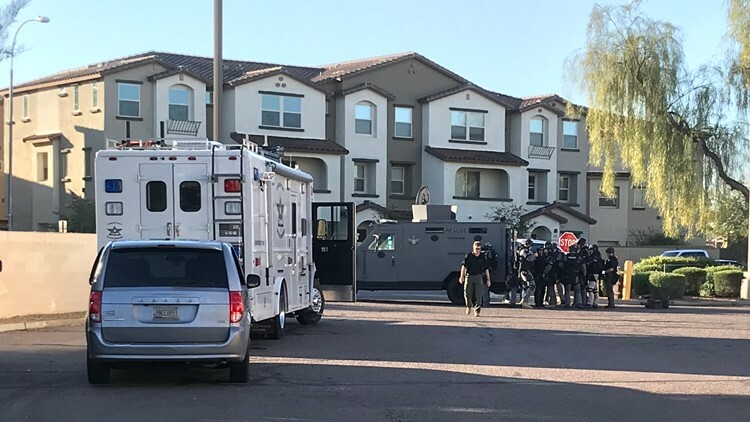 According to Chandler police, ADOT detectives were attempting to serve an arrest warrant around 6 a.m. to a suspect at an apartment complex near Chandler Boulevard and Alma School Road. ADOT says the warrant was a part of an in-state forgery or I.D. theft investigation. Police said the suspect got into a vehicle and drove at the ADOT officers striking one of them. The other officers opened fire on the vehicle. ADOT says this is the first time the department has been involved in a shooting. Police said no ADOT officers were injured. The suspect stopped driving while still inside the complex and fled on foot. He is described as a black man in his 20s. It is not known if he is armed or not. Chandler PD are "actively searching" for the suspect in the area of Chandler Boulevard and Alma School Road. A school in the area, San Marcos Elementary School, is on a modified lockdown, meaning students are able to move about the campus while police patrol the school.